Cloud Firestore: an improved solution with a more intuitive data model. It features richer, faster queries and scales better than the Realtime Firesbase database. 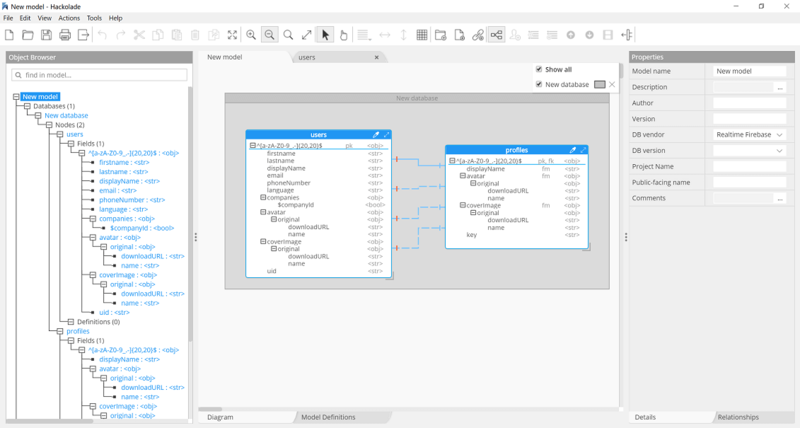 Given the differences between the 2 approaches, data modeling for the Cloud Firestore requires a separate plugin. To perform data modeling for Firebase with Hackolade, you must first download the Firebase plugin. Note: the reverse-engineering of documents is not currently available. It is being developed and will be released at a later time. Each Firebase Realtime database data is stored as JSON objects. There is a fundamental difference with many other NoSQL document databases: Microsoft Azure Cosmos DB strongly suggests to store documents of different types into the same "collection". Pricing is consistent with this recommendation. It may seem counter-intuitive, when moving from a RDBMS or MongoDB, to store record (documents) of a different nature in the same container (collection), but this is done for performance and pricing purposes. A “type” attribute is necessary to differentiate the various objects stored in the collection. Most deployments have a low number of collections, although there is no hard limit. Not applicable, as Firebase does not provide any way to enforce any kind of schema. Note: the reverse-engineering of documents is not currently available. It is being developed and will be released at a later time. For more information on Cosmos DB in general, please consult the website.